This is my (muslin) test garment of the Colette Patterns Negroni Shirt. I sewed it in about an hour...and the photo does show that it was hastily sewn. But then again it is a muslin, so I did not fell the seams, I used very inexpensive fabric and buttons, and I only gave it a light press. If you are looking for a slim-cut pattern...this is it. 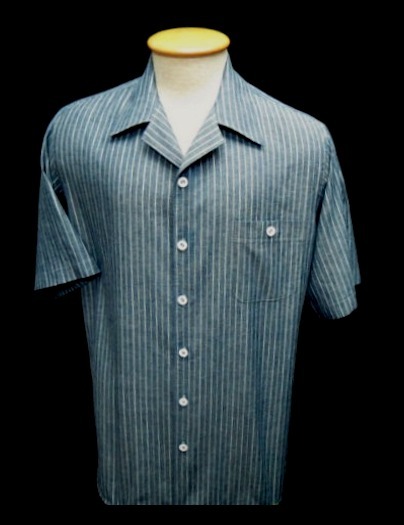 ShirtMakers call this type of draft a "Contour Shirt". It is a bit big on my Man-a-Kin, but fits Roger well...just enough ease through the upper chest, shoulders, waist, and hip to be comfortable but not sloppy. The sleeves are a nice length..neither too long or short. Is it worth buying? Yes! Will I sew it again? No. While the Negroni pattern is drafted well enough, it does have more cap ease than I prefer, and it has a straight-cut yoke that thankfully is rescued by a nicely curved back. But I already have countless hand-drafted variations of this style silhouette (a convertible collar shirt) both for my husband Roger and my clients. And of course I do not use commercial patterns when I make shirts with my label for clients. 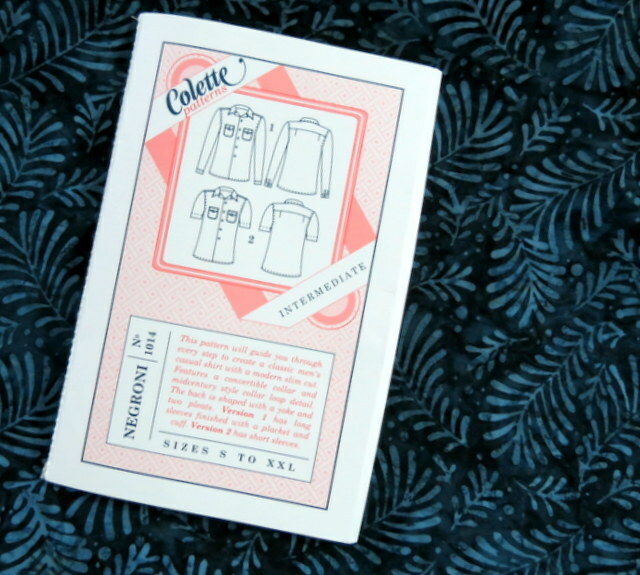 The pattern instructions come in a cute little booklet and are well written and illustrated. 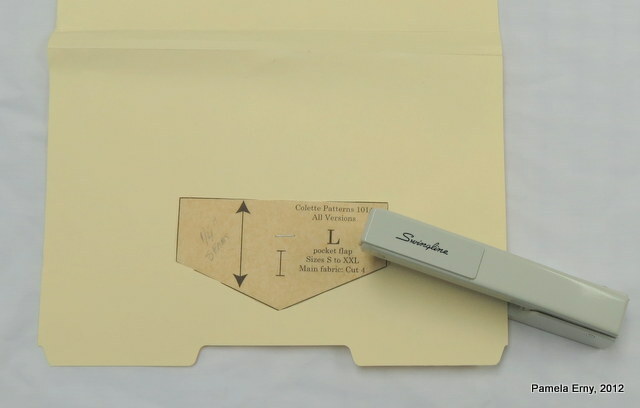 Follow them carefully, as different seam allowances are indicated for use on some parts during construction. How To RESCUE Wrinkled INTERFACING! Like me, probably more than once. Luckily there is an easy fix, and it starts at your grocery store. First, roll out a length of the Parchment Paper onto your ironing board or other pressing surface...and secure it with a few glass-head pins (or other pins that will not melt). 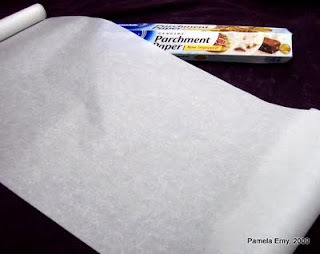 Next, Place your wrinkled interfacing GLUE SIDE DOWN onto the Parchment Paper. 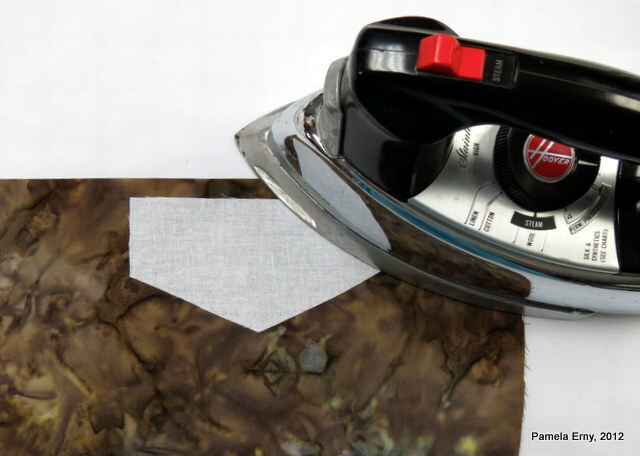 Then with your DRY iron set on on a LOW setting, slowly slide the warm iron over the wrinkles. You will see the wrinkles disappear as you slowly move the iron. The interfacing does not stick to the slippery Parchment Paper at all. Then move the next section of wrinkled interfacing onto the paper and iron it. 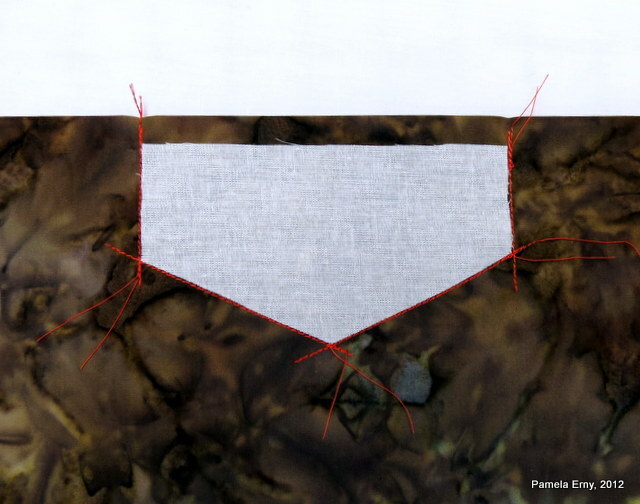 Since the iron is set below the temperature needed to melt the fusible resin, the interfacing is not adversely affected at all. 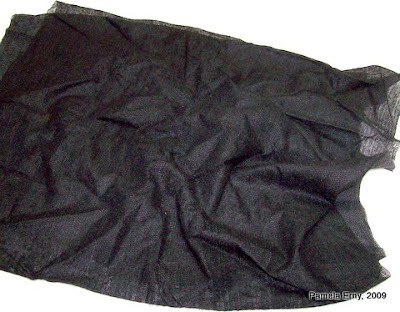 When you are finished, your once wrinkled interfacing is flat and smooth again, and ready to fuse to your fabric! You may download a *Free* PDF of this article...by going to the TUTORIALS page at www.FashionSewingSupply.com . TUTORIAL--Perfect Pocket Flaps every time! There are many interesting things that I have learned about shirt-making over the years, and one was how to sew pocket flaps...and other "shirt-parts" without seam allowances. Yes, you read that right...I'll be showing you how many custom Shirt-makers sew first, then add the allowances later. using the pocket flap from Colette Pattern's Negroni Shirt. Since the pattern is multi-sized, I backed all the tissue pattern pieces with some nasty old spun-poly interfacing I've had stashed for years...in preparations for tracing the size I need to make the shirt. Note that the pocket flap of the Negroni Shirt is the same for all sizes. The first thing I did was to attach the pattern piece to an clean file folder with a stapler, as you see above. I stapled it to the card-stock so it would stay in place as I traced around it...which is the next step. 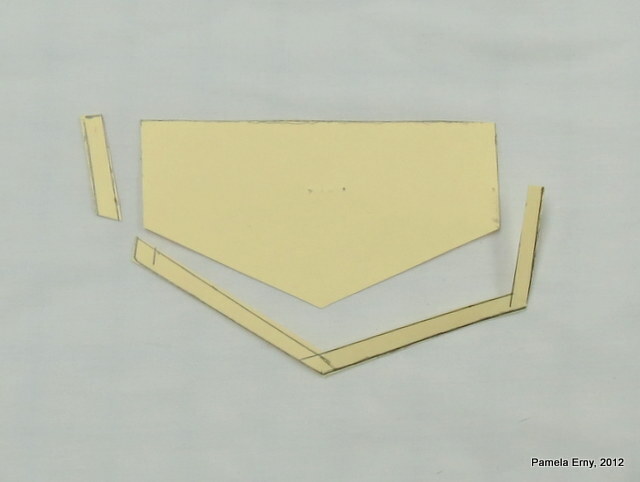 Then I quickly added the 1/4" the seam lines to all but the top long straight side of the flap pattern, as you can see below. Next, I cut it out....cutting OFF the side and bottom seam allowances and discarding them. 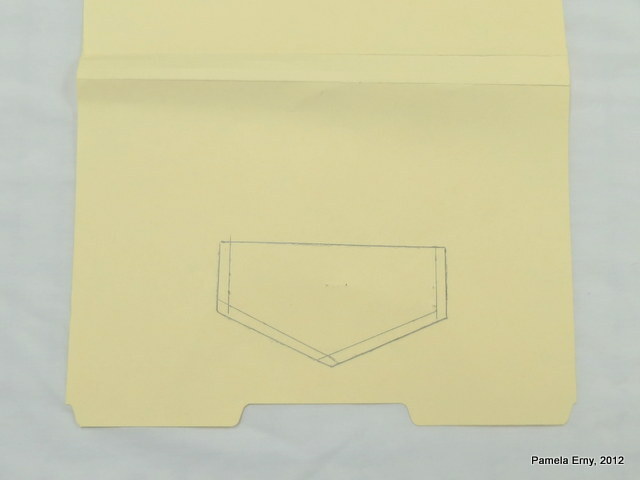 Now I had a hard copy of the pocket flap, minus its side and bottom seam allowances. Then it was time to take a piece of Interfacing, fold it in half wrong sides together , and lay my newly trimmed pocket flap on top. 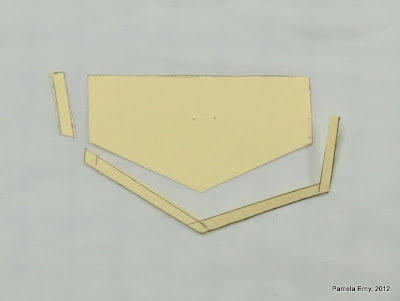 The next step is to cut out 2 identical pieces of interfacing, and the best way I've found to keep all the layers from shifting while I cut is to staple them together, as you see below. Just FYI..the interfacing used in this demo is the new ProWoven Light-Crisp 100% cotton Fusible from www.FashionSewingSupply.com Many shirtmakers cut the small pieces like pocket flaps last, from the scraps left after cutting the main pieces. 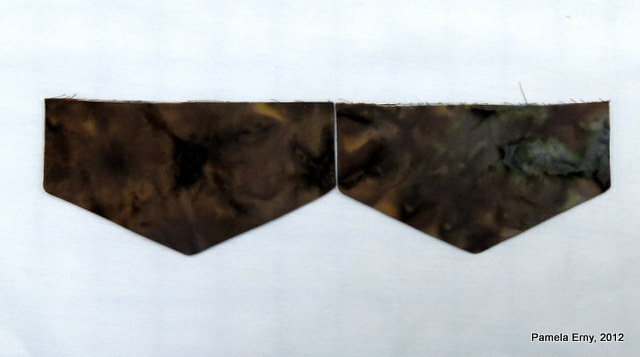 So after the interfacing pieces were cut out (and staples removed) they were each fused to a scrap of fabric that was folded RIGHT SIDES TOGETHER. 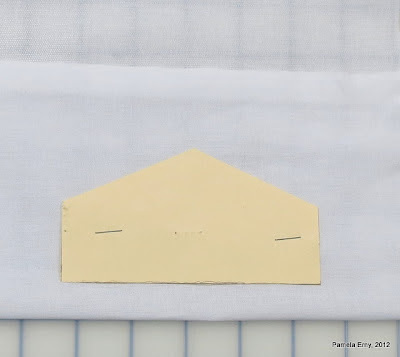 In the photo below, the folded edge of the fabric piece is at the top, and the Interfacing piece is being fused about 1/2-inch below the fold. 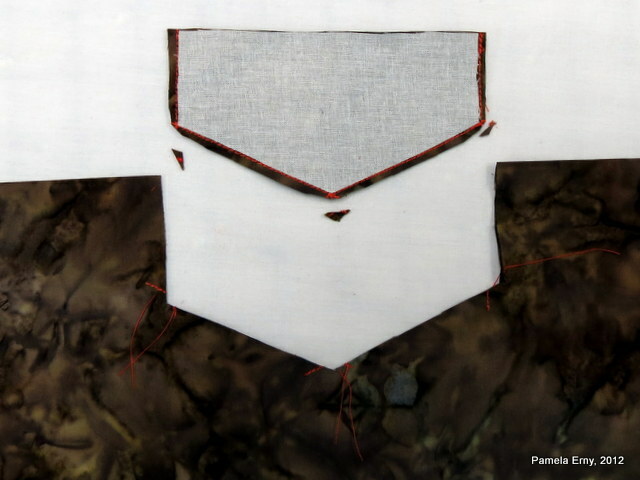 ...and as you can see, I chose to stitch "straight-through" the angles of the interfacing template..it is the way I was trained, and is my preference. You may choose to pivot-and-turn, with your needle in the down position to take the turns...but do make sharp turns and follow the outline of the template exactly. Note the top long edge is left unsewn...because that is where the flap will be turned right-side-out. Next, I needed to add those seam allowances back! But first I cut right along the edge of the interfacing on the top long edge, but then I cut 1/8" away from the stitching around all the other edges, as you see below. And as you can see I also trimmed the "corner-points"
After I fused the remaining piece of interfacing to another piece of fabric, then stitched and trimmed...I was ready to turn the flaps. And because they were sewn using identically cut pieces of fused interfacing as the "stitching guide"..the flaps are identical twins. The ones you see below were left unpressed...just turned by hand and patted flat with my hand..and look how good they look. 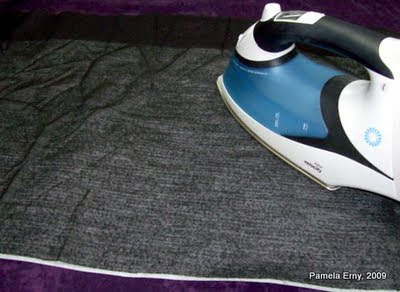 OK...I'll confess..my iron stopped working just before I was ready to press the flaps...but I wanted to post this tutorial and it might take a while to get another iron...etc, etc. But heck, even unpressed they look a great deal better than many I've made using a different sewing method and an iron that worked! Next up--The Negroni Shirt! And my RANT about "Self-Drafted"
Yes...I know that I am the last one in "Sewing Land" to make the Negroni men's Shirt Pattern (www.ColettePatterns.com). I took a quick look at it several months ago, but when life got in the way I put that project aside.........and then I lost the pattern! I ordered a new one and now that it is here, I can compare it to Vogue 8800 . Since I can already see that the patterns have significant differences, my comparison will merely be to define those differences rather than make a big declaration that one is better than the other. And then after the Negroni, I will be showing you a Victoria Jones Men's Shirt pattern, the authentically classic "Hawaiian Businessman's Shirt"! -- My clients pay for shirts that are personally designed for them by me, from patterns that are custom hand-drafted to their measurements. -- It takes me less time to draft a shirt pattern from a given set of measurements than it does to alter a commercial pattern. -- And speaking of drafting and time, it takes me much less time to sew a shirt from one of my own custom patterns. That is because I add different amounts of seam allowances to various pattern pieces so that virtually no trimming is needed while the garment is being sewn. I get excited when I read on a blog or sewing forum that a garment was made from a "self-drafted" pattern..I love when people design their own clothes! But nine times out of ten when I click the link, I find out that the "Self-Drafted" garment was made using parts of commercial patterns that someone Else, not "Self" drafted! 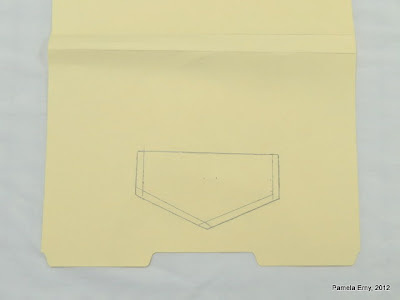 A hand-drafted pattern ,"Self-Drafted" pattern, or a Custom-Drafted garment, should mean that NO parts of the pattern existed before the point of a pencil met a blank sheet of paper (unless we are using a pocket or cuff, etc, that we...all by ourselves...have drawn from scratch.) A self-drafted pattern is not a "FrankenPattern" where pattern pieces that someone else designed have been re-arranged, or when more curve has been taken to a seam of a blouse that someone else drafted, or when a so-called Self-Drafted pattern started with a bodice piece or any pattern piece previously in existence that someone else designed and drafted ! It would be like me making a copy of a photo of the elegant Erica B or gorgeous Mimi G, pasting my head over theirs, and saying, "This is what Pam wore today". Of course nobody would fall for it, and I would be a called a fraud and a deluded old fool...while you all laughed hysterically. Yet others blithely claim "This is what I self-drafted today" when they have essentially "photo-shopped" existing patterns. Sure, we all have taken a sleeve from a Simplicity pattern, sewed it to the bodice of a Vogue pattern, onto which we sewed the cool pockets from yet another commercial pattern, etc, etc...to make a garment look the way we want it to look. But c'mon, that is NOT a "Self-Drafted" pattern, and most of us know it...we might not know just what we should call it (I sure as heck don't know). But most of us would not have the temerity to claim it as "Self-Drafted". On the other hand, when we see a a RTW dress and we use the shape of the bodice and skirt as inspiration, and then we draw a pattern (all by ourselves) in an attempt to mimic that garment...in my opinion that qualifies as a self-drafted pattern. Certainly not an original design idea, but I am not talking about design here...that is another kettle of controversy. I have been talking about "Self-Drafted" Patterns....that often are anything but.